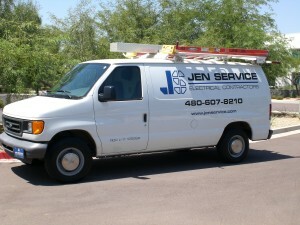 Since opening in 1997, Jen Service has provided quality electrical service and solutions for many commercial, industrial, residential, technical and professional business customers throughout the Valley. Our staff has the skill sets required to address a wide range of projects, unique installations and address the most difficult problems. We’ve worked with customers large and small; ensuring that the same level of service is maintained no matter the client’s size. We are built to handle projects of all scopes and sizes. Whether you have a routine one-hour service call, or a complex site renovation – we have you covered! Our courteous techs are committed to providing a superior level of service. They will explain the problem, go over possible solutions, discuss the time it will take to repair, explain the cost and clean up before they leave. Have you ever had an emergency in the middle of the night? How about on a major holiday? It can be a nightmare. For your convenience, we offer emergency service around the clock with a two hour response time. We also provide same day expedited service upon request. Jen Service is committed to be there when you need us most.